In a small bowl mix miso with 1.5 tbsp of butter. Heat the oil in a large non-stick frying pan over high heat. Add the remaining ½ tbsp butter. Sprinkle the steaks with salt and pepper and cook, in batches, for 1–2 minutes each side. Spread a little miso butter on the steaks after the first flip. Transfer to plate to rest. Turn up the heat in the pan. Add chopped shallots and stir occasionally, until soft. Toast rolls. (Or just do it quickly on a hot pan.) Thinly slice steak against the grain. 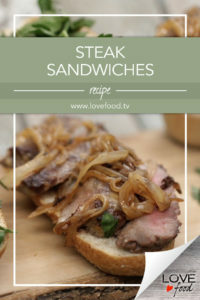 Combine mayonnaise with relish and mustard and spread onto each roll half and top with the steak, and remaining sauce, shallots and greens. Sprinkle with pepper to serve. Love Food: Season 2 from Clerisy Entertainment on Vimeo.